Any application and any data, without limitations. As a Veeam partner for over 10 years, we help businesses to reduce the cost and complexity of building and maintaining your own off-site backup infrastructure. Working with virtualDCS, you can extend your business availability and make sure that your business is Always-On™ and available. Simply register your interest with us and you’ll receive a unique activation code that you can then redeem. Give us a call or send us an email with your unique activation code and we’ll register it on our system. It only takes a few clicks to configure the solution and connect to our UK based data centres. -Users must consume FREE Cloud Connect services within 4 months of program registration. -Customer must own or purchase Veeam Availability Suite, Veeam Backup & Replication, or Veeam Backup Essentials (any edition) and be current on maintenance at the time of activation code registration. -Customers already consuming Cloud Connect services are also eligible, as long as the funds from this offer are used to expand their service or purchase new services. -Limit of one activation code per Veeam customer account. 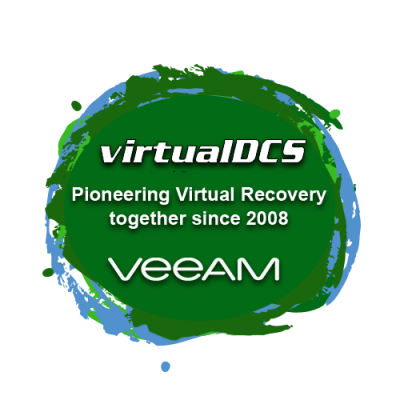 -Available to Veeam customers located in North America (US and Canada), Latin America, EMEA (Europe, Middle East and Africa), Australia, New Zealand and Pacific Islands. Up to £640 in FREE Cloud Connect services listed in GBP. -Customer must present a unique activation code to a reseller or VCSP partner for validation by Veeam, prior to consumption of Cloud Connect service.